Fuglies safety glasses have been tested, and are certified, to meet the AS/NZS1337 standard for medium (ballistic) impact industrial eye protection. 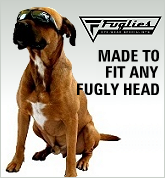 All Fuglies sunglasses are UV400 rated to meet Category 3 of Australian Standard AS1067:2003 for UV and IR protection giving them SunSmart program compliance. You know those readers you get at the chemist or the hardware store? The wire frame ones with the narrow, thumb-sized lenses that make everything easier to read but end up falling apart after you've used them a few times? Well Fuglies Safety Readers are what readers should be! With magnification across the entire lens (these aren't bifocals) our readers are AS/NZS1337.6 safety certified for medium impact protection, have large crystal clear polycarbonate lenses for excellent visibility, and a tough lightweight polycarbonate frame. The lenses also have a silver flash mirror for glare reduction without reduction in light transmission or visibility, and block 99% of UVA and UVB radiation. Available in 1.5X, 2.0X and 2.5X magnification, Fuglies Full Lens Safety Magnifying Readers make a great budget alternative to prescription safety glasses for the workshop, job site or anywhere else that needs safety and comfort combined with vision assistance. Delivery within Australia by your choice of Standard, Courier or Platinum Priority delivery starting from $7.95 for 1-2 pairs or $11.95 for 3-5 pairs. AFPO and international delivery available. Click here for delivery information. AS/NZS1337.6 Certified. 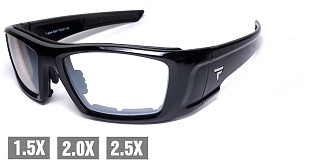 Full lens magnification with crystal clear medium impact safety lenses in our gloss black Raider frame. Silver flash mirror for glare reduction without reduction in light transmission or visibility. Gloss black polycarbonate with removable foam gasket and adjustable nosepiece - no strap. snow, as well as oncoming traffic. fit over your prescription frames. A full seal fit, lightweight fully vented polycarbonate frame, and tinted polarised or clear safety lenses.